A couple of our most frequently asked questions are how we find the barbers and barbershops such as Cuts and Bends barbershop that we feature on our YouTube channel and what makes us choose them. We spend a lot of time researching and take several factors into consideration before we ultimately decide where to film. 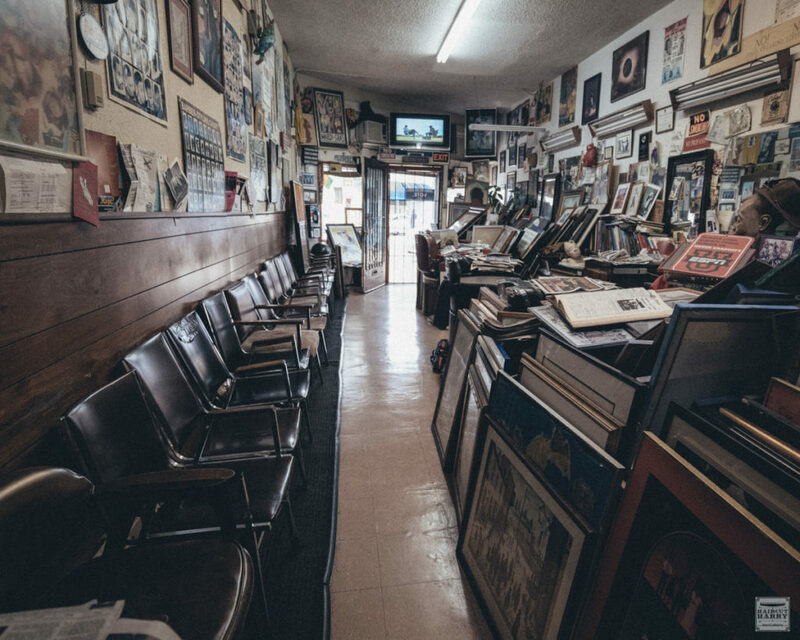 You guys know we love authentic old barbershops and are always on the look out for them while traveling. The kind without any social media nor any online presence. Some of theses shops can only be found by being on location looking and through the help of local knowledge. One of the things we really like about old barbershops are the collections built up over time. Where it takes years and decades to look that way. It gives a totally different feeling by just stepping inside. Usually when we do find these incredible old shops, we find a very interesting barber. 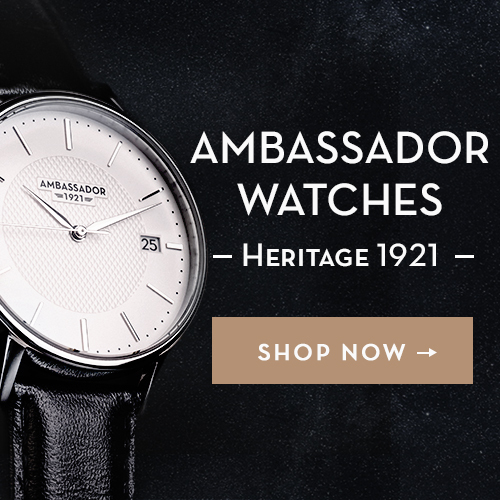 While researching for the US, we turned to Rob Hammer for a recommendation. 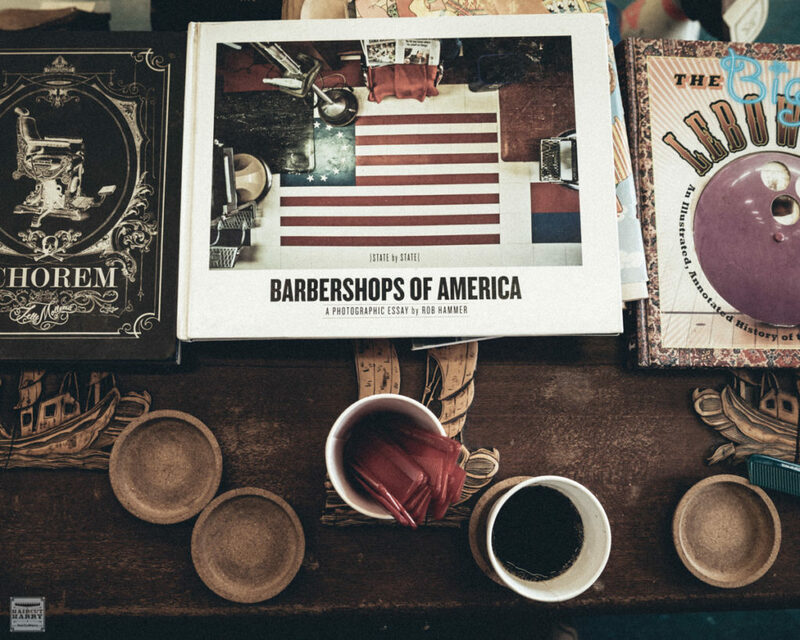 If you didn’t already know, Rob is the photographer and author of the beautiful coffee table book “Barbershops of America.” What started as a personal project evolved into six years of crisscrossing the U.S.A. exploring and documenting old-school barbershops. 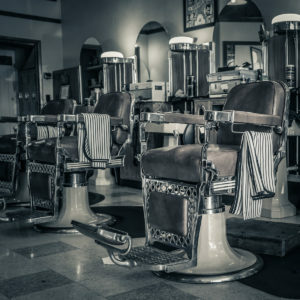 During his time traveling across the US, Rob visited approximately 1,000 barbershops. 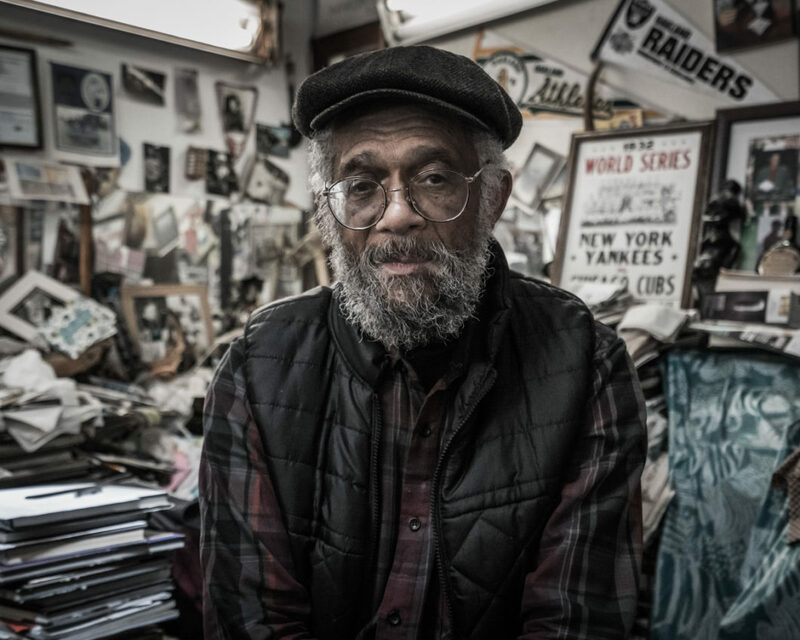 So when Rob recommended Kenneth Hogans Sr. and his shop Cuts and Bends in Oakland, California, we were very grateful and excited! My first time in Oakland was over twenty years ago. I didn’t see much as I was there for work, but I remember staying in downtown across the road from the office I was at for a few days. Oakland today is not the same place it was back then. The city is experiencing an ongoing transition as the high prices in San Francisco has encouraged people en masse to migrate to a more affordable Oakland. This has also triggered revitalization to an extent in the downtown area as new businesses and shops open up to serve this growing new population with the services they are seeking. Oakland was once home to one of the largest African American populations in California. In the 1980’s the urban black population was around 47%, this dwindled to around 35% in the 2000’s. Over the next decade towards 2030 Oakland’s black population is predicted to decline to around 70,000 or 16%. With the changing demographics comes the change to the community services provided by the locally owned businesses. Over time many close up as people move out and owners retire. Other well established icons hold on and fair the changes around them. Cuts and Bends Barber Shop is one such place. Situated in the same location since the eighties, the shop has definitely seen the local community evolve and change over the years. 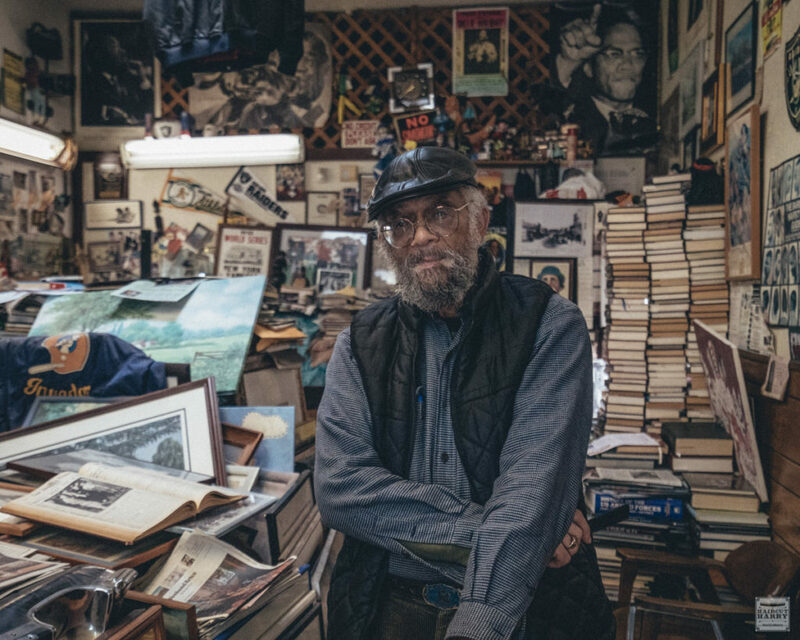 The shop still beats its own tune today having naturally grown to include the acquisition of books, paintings, and knick-knacks that fill the shop reflecting a historical psyche of the local black community. 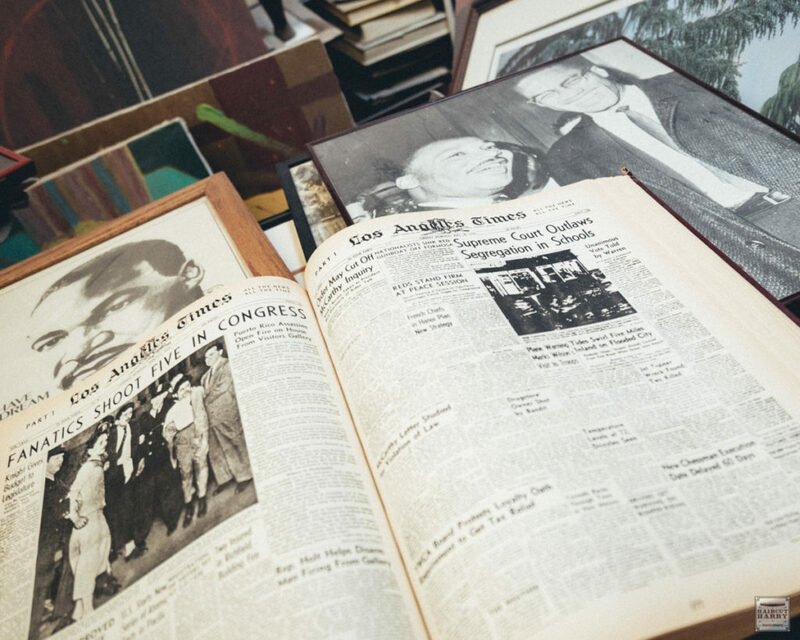 Martin Luther King Jr. and Oakland Raider memorabilia hang on the walls. 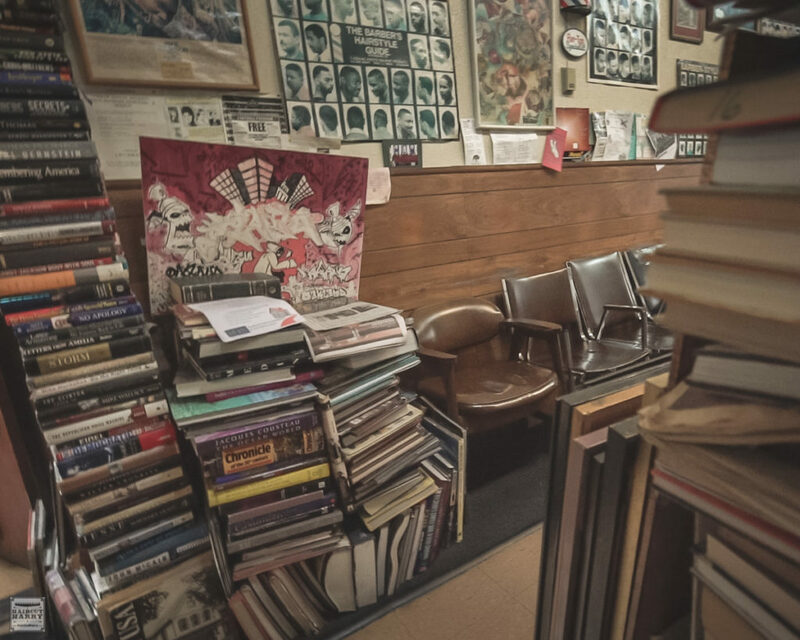 Contemporary political memoirs and local newspapers from Kenneth’s native Natchez, Mississippi are piled up to surround the barber chairs. 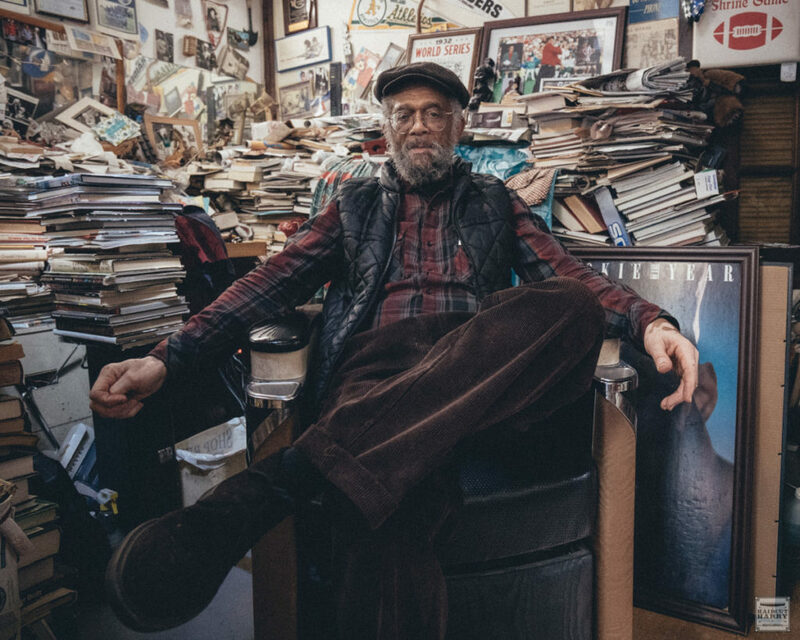 As I entered the shop, it felt like walking into an old curiosity shop displaying pieces of the community through the decades. 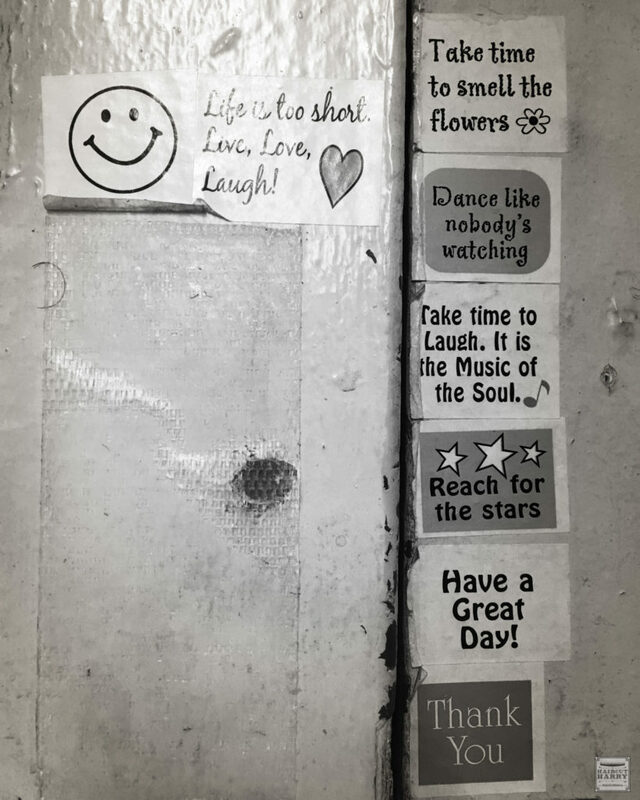 On the walls, on the floor, and tucked away in every nook and cranny. A Conversation with Kenneth Hogans Sr.
Kenneth had been jumping around like a young guy so I joked he was pretty spry. Kenneth has been in or around a barbershop his entire life. His grandfather opened a barbershop in 1928. Kenneth grew up around that old shop hanging out playing with the tools. At one point his grandfather didn’t have a barber so a guy once asked Kenneth to cut his hair. “I tell them I don’t know how,” Kenneth explained. The customer told Kenneth to cut his hair anyways. Kenneth still got paid and with it an interest was sparked to learn the trade. “If you really work at it you will get better.” -Kenneth Hogans Sr.
Kenneth moved to California just after high school in 1956. He laughs as he tells us how his mother thought he was going to UC Berkeley. Kenneth wanted to go to barbering school, but his parents were reluctant to help so he joined the Air Force. 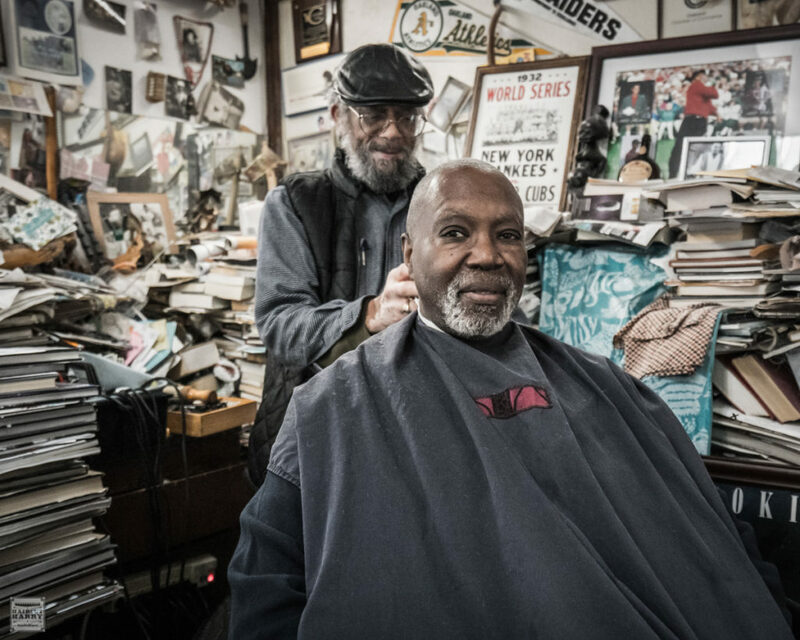 After his military service Kenneth stayed in the Oakland area and completed barbering school in 1960. Kenneth was sitting in his barber chair. His collection of books towering over him as we spoke. An eclectic collection of books and magazines. Posters and paintings on the walls and propped up on the floor. In between where space permits knick-knacks and carvings occupy the remaining spaces. It is quite the collection. “I start seeing things I like and I start picking them up. 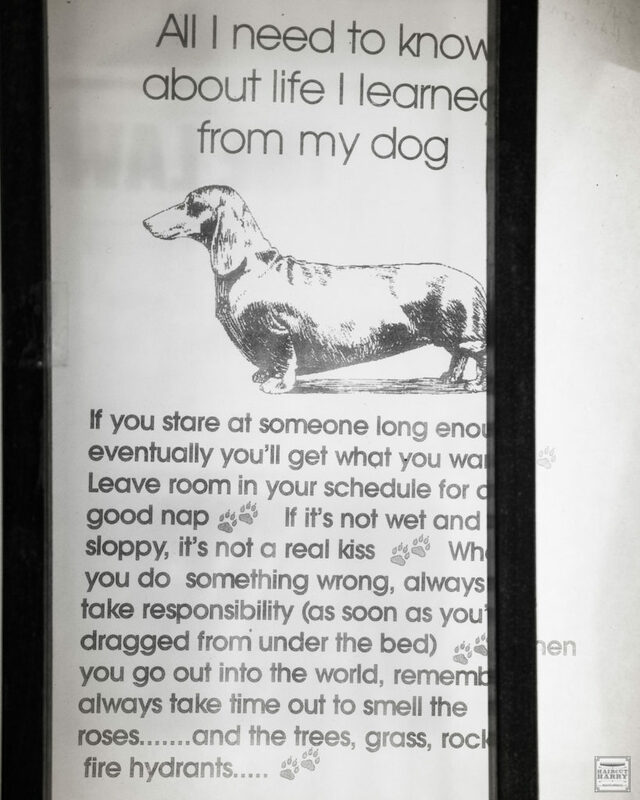 Especially posters. . . . Rather than throw stuff in the garbage I’ll take it and stick it on the wall,” Kenneth explained. It was a collection that just started to amass over time. The books are a community book exchange. Kenneth explained some people bring a couple in and take one out. One young customer had a book in hand as he left the shop. As we filmed and spoke a steady stream of customers came and went from the shop. Each time Kenneth was greeted like an old friend and for good reason. 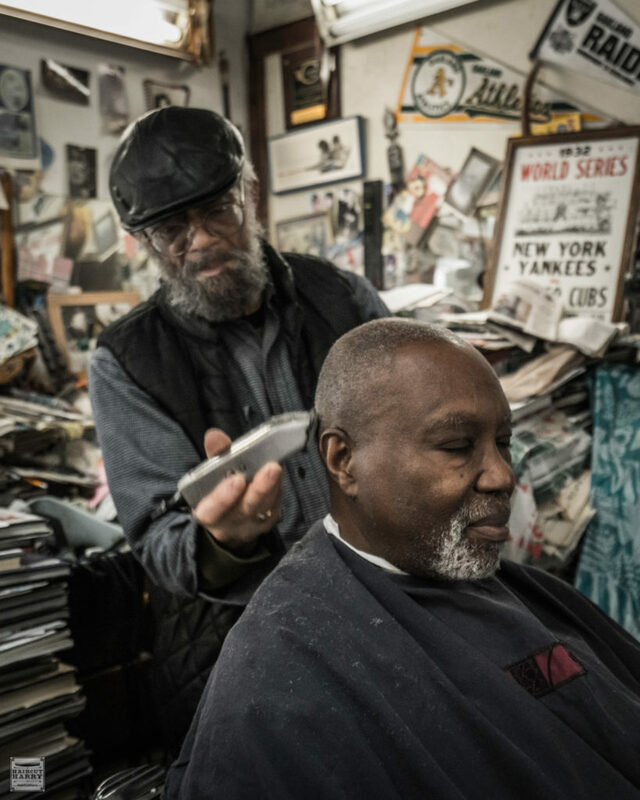 Kenneth has been around long enough to see generations grow up in the neighborhood and in his barbershop. Call it gentrification or a changing community, just around the corner there are plans to build a new football field. “It was all basketball before,” Kenneth explained. What happened to the people that were living here in the neighborhood? As people moved into the area, people moved from Oakland further out for the same reasons. Places like Stockton were cheaper to live in and in the eyes of many a better place to be and raise a family. In many ways the problems people were trying to avoid moved with them. Kenneth was keen to point out that for a community to work it needs people willing to give. Growing up in the south, Kenneth talked about how farmers would share some produce with folks they did business with. In a lot of way this was happening in the city too. People have fruit trees with a lot of fruit, and rather than let it all go to waste they would put some out front for people to take. Kenneth said he probably hung this up on the front door around 20 years ago. Stickers on the front door of the barbershop. “I find myself each day before I come to work. I come up and clean up outside,” Kenneth explained. Perhaps a bit of discarded garbage, other times perhaps a needle or dog poop. We asked Kenneth what keeps him going. Why he keeps doing what he does within the community. It means a lot to Kenneth to work in the community and he loves people. For Kenneth it was making the little positive impact within the community. 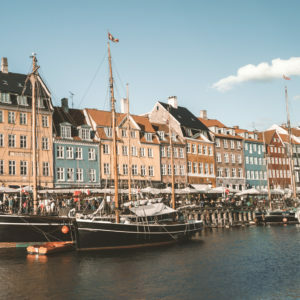 It may be going above and beyond to help clean up a little piece of the street, doing the best you can rather than nothing, or simply being a positive role model for future generations. Subscribe to get notified of new blog posts!